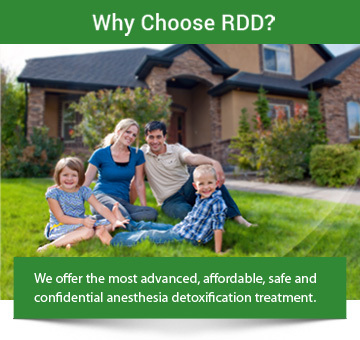 I just want to tell you thank you for all of your assistance in getting me into RDD. I’m still recovering but feeling much much better and more importantly I no longer feel like an addict, I feel like I’ve been born again. Your kind voice on the phone really made it easy to take the leap and do this and I’m so happy I did. I wish I could have met you to give you a big hug! All the best. I wish you a long and happy life and keep helping people. You guys are changing lives when most other doctors are just looking to make life methadone/suboxone patients. Please thank everyone at RDD who made this happen for me.